Does AD 2010-07-02 apply to your Honeywell RNZ-850/851? Last summer I wrote an article about the importance of complying with Airworthiness Directive (AD) 2010-07-02 before the deadline of November 3, 2012. This AD is applicable to the Honeywell RNZ-850/851 Integrated Navigation Units (INU) and addresses possible erroneous glide slope or localizer display indications. The deadline has since come and gone, however, at Duncan Aviation we continue to field phone calls from operators who have discovered their AD had been signed off as being complied with, when in fact, it has not. Cessna released CIL-34-02 on March 18, 2013, to address this issue. 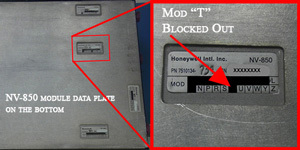 There are two data plates on the Honeywell RNZ-850/851 INU. One is on the front, the other on the bottom. There is confusion about which data plate should be inspected to determine if your unit is in compliance with AD 2010-07-02. The answer is BOTH. Two conditions must be met in order for the unit to be in compliance. 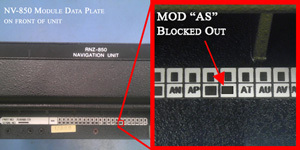 Closely inspect the mod data plate on the front of the unit. In order to be compliant, the square with the “AS” must be blocked out. Next inspect the status of the mod data plate on the bottom of the unit. In order to be compliant, the square “T” must be blocked out. Your unit is only in compliance with AD 2010-07-02, when BOTH of these conditions are met. Duncan Aviation can perform the modification necessary to comply with AD2010-07-02. Contact a Duncan Aviation Avionics Tech Rep for more information.